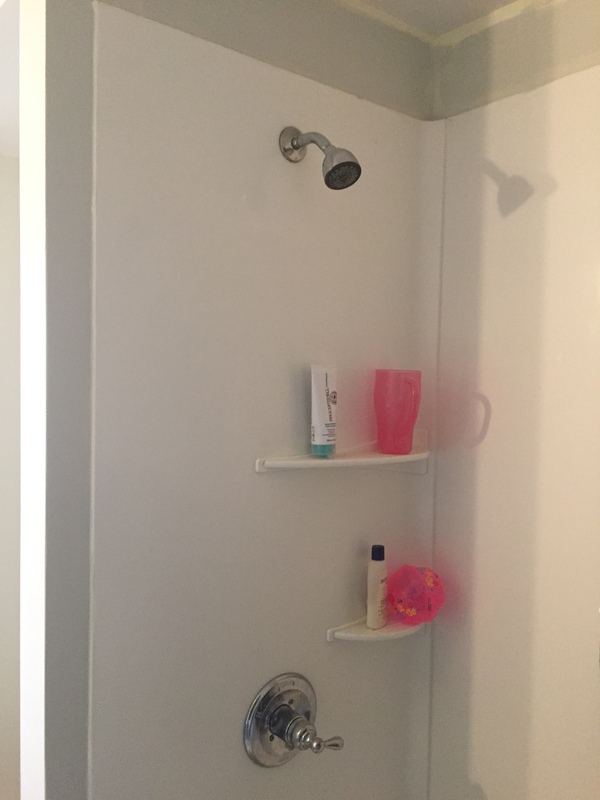 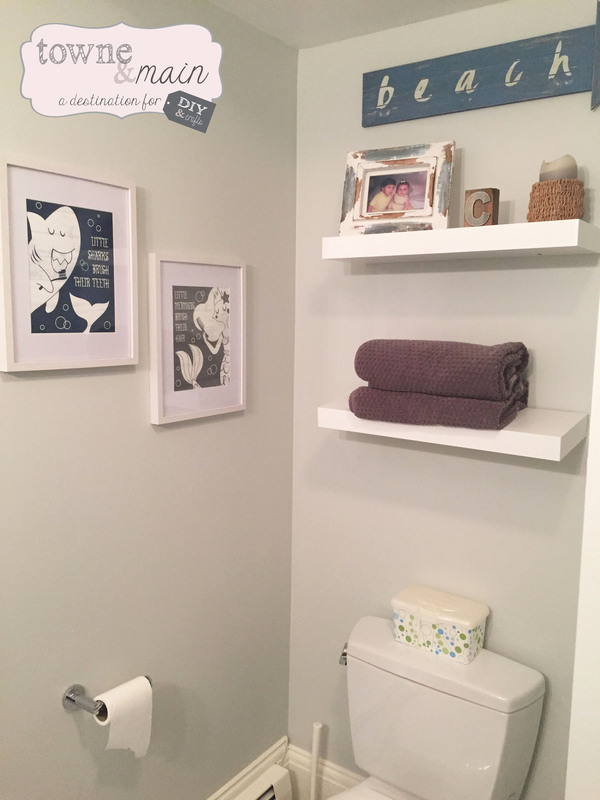 So my husband and I tackled the kids bathroom remodel – it was a process that took about 4 weekends worth of work. 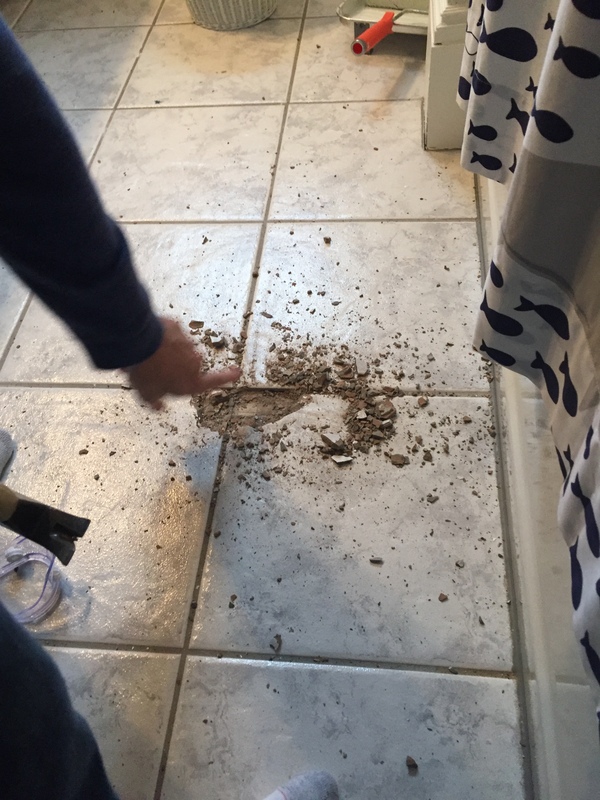 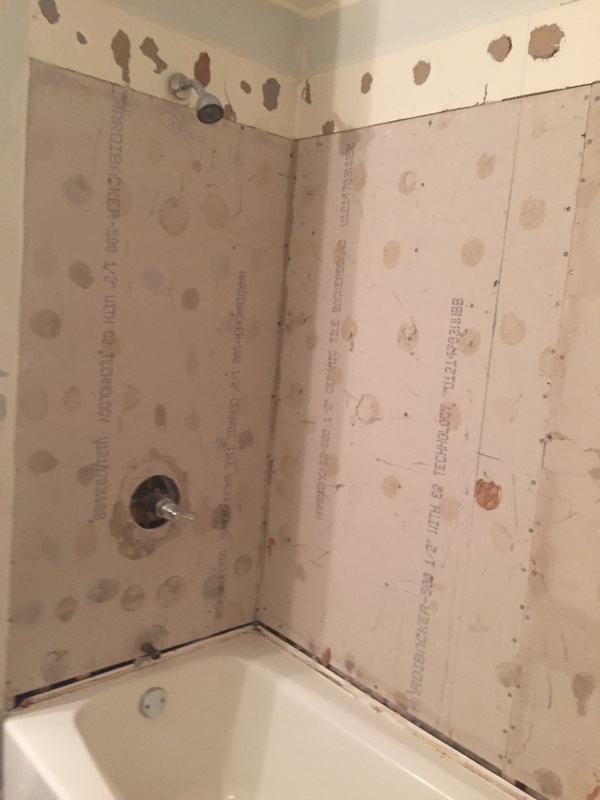 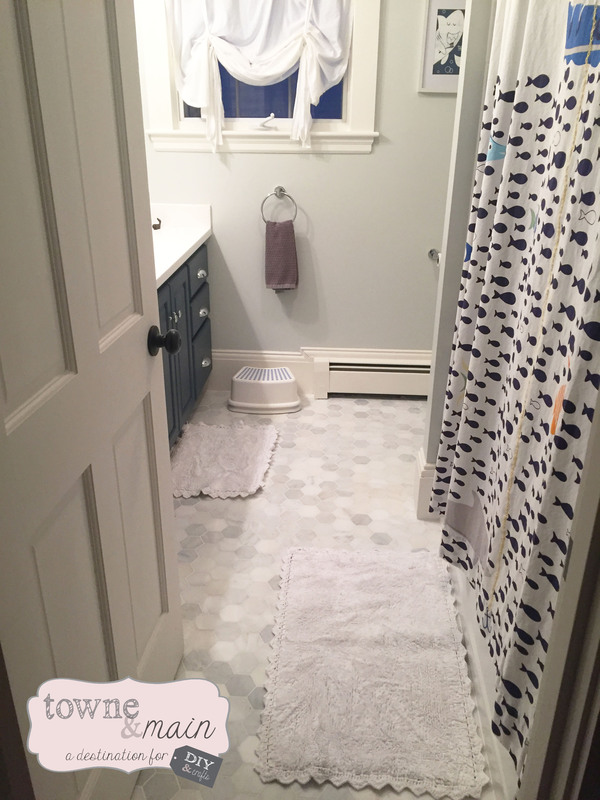 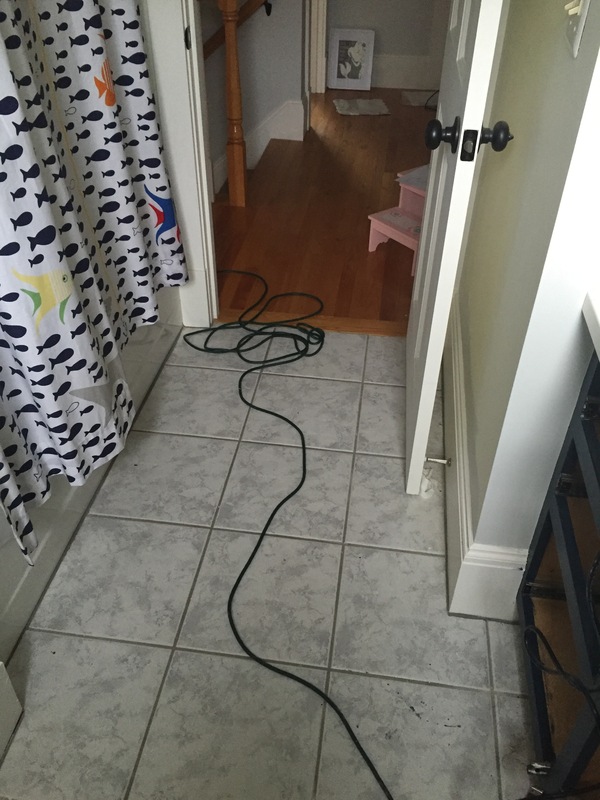 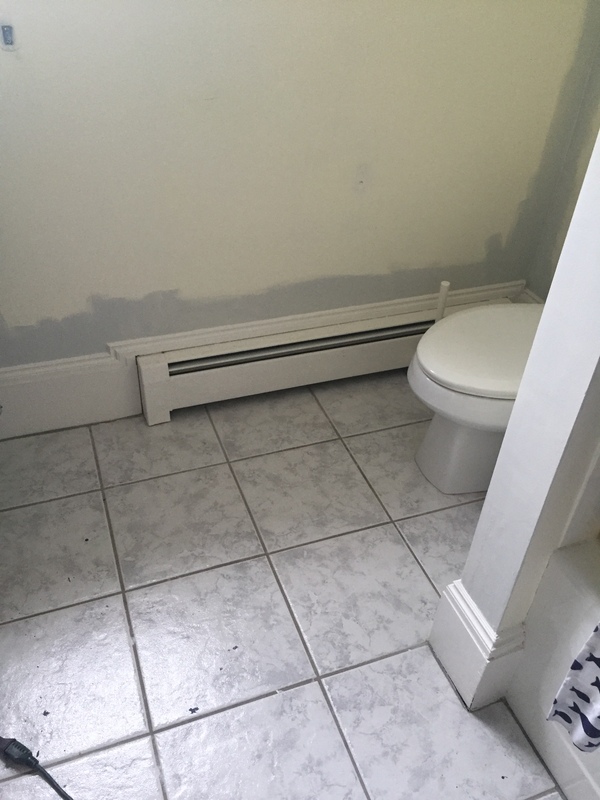 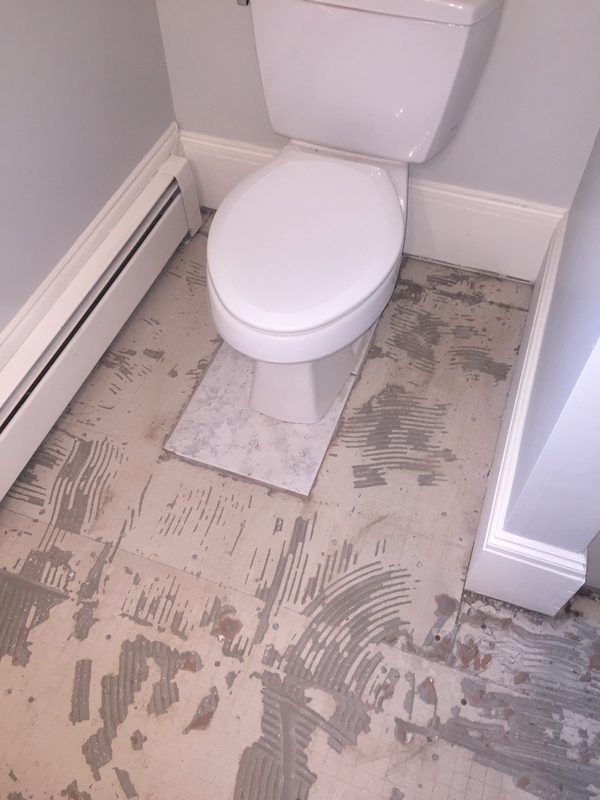 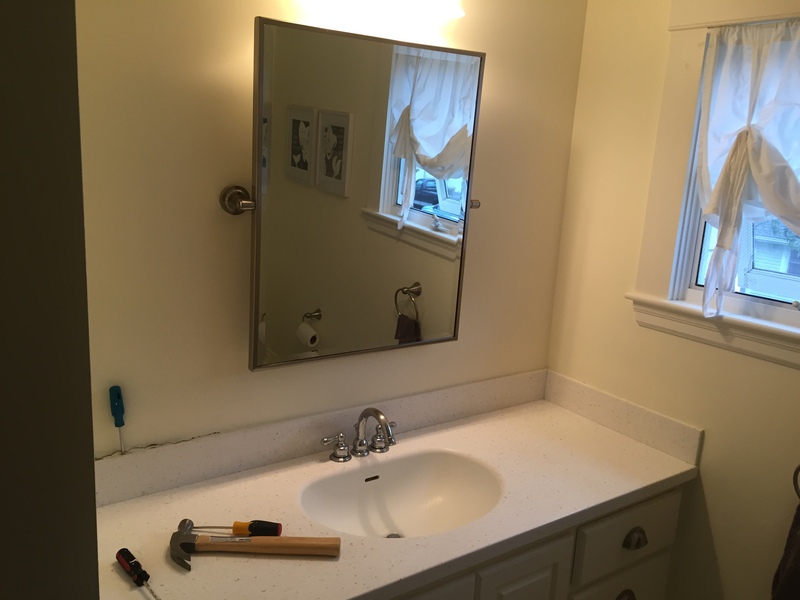 Here are some before shots – the tile was dated and the vanity was crying for a make over…. 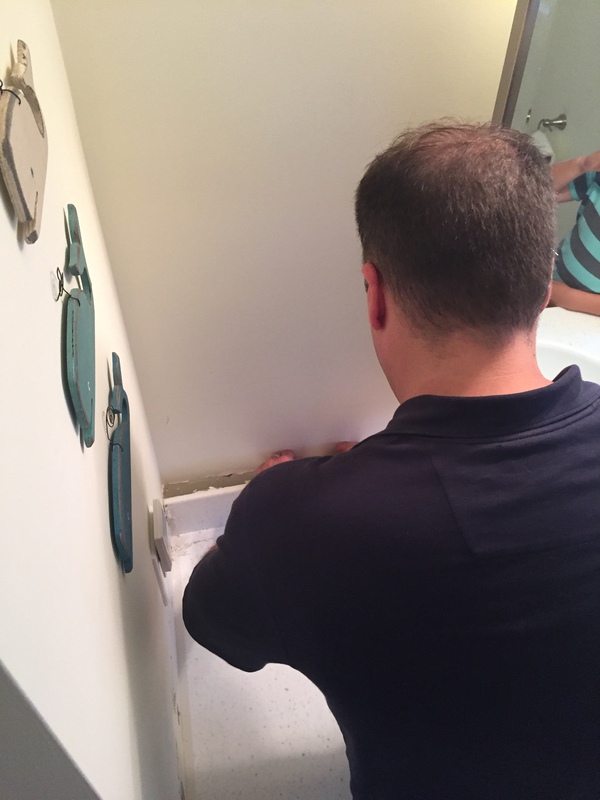 First we enlisted some help! 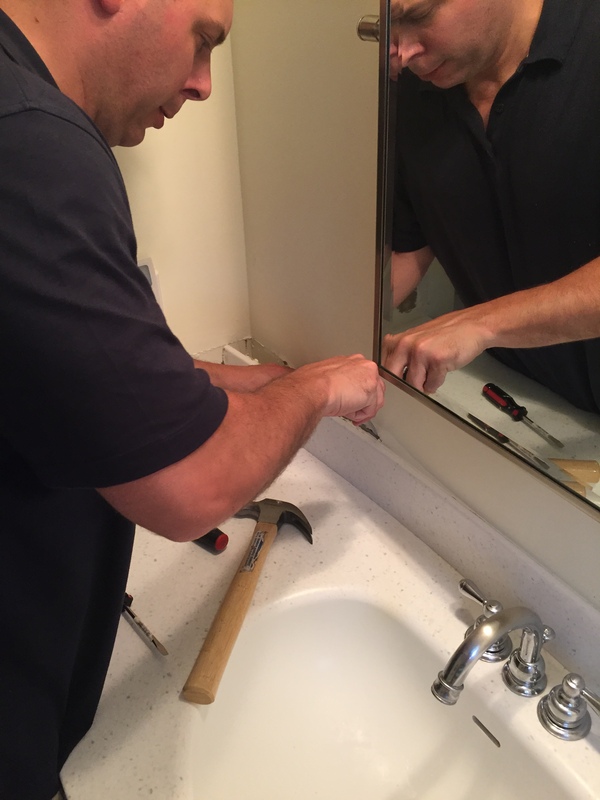 and then the muscle got to work! 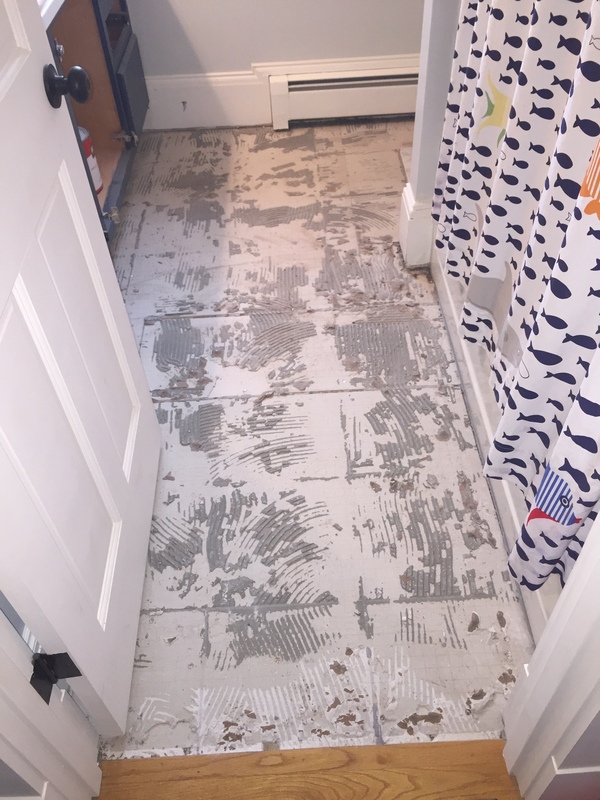 We removed all the floor tiles and the shower surround which was 4 slabs of solid stone! 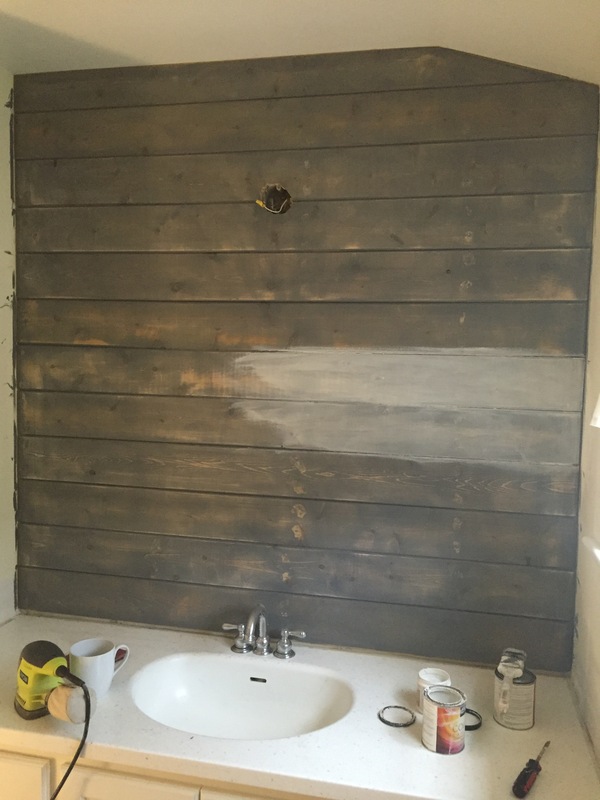 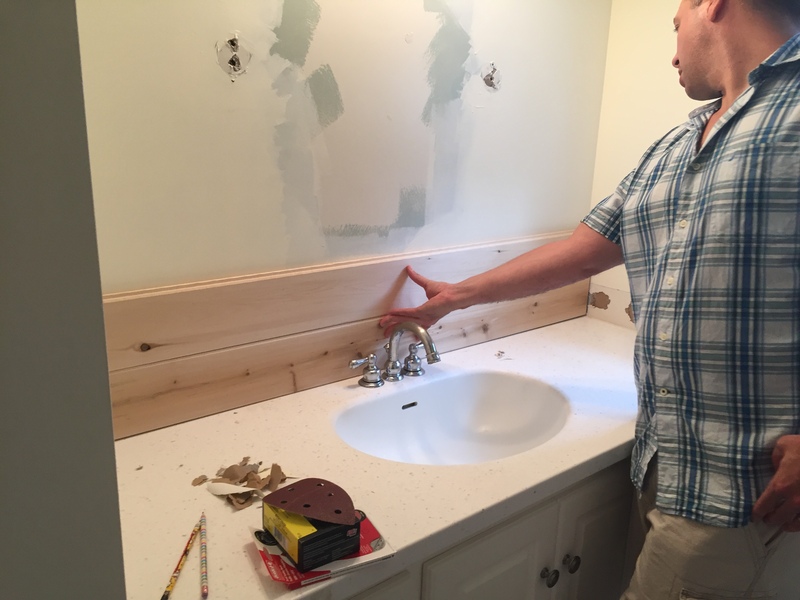 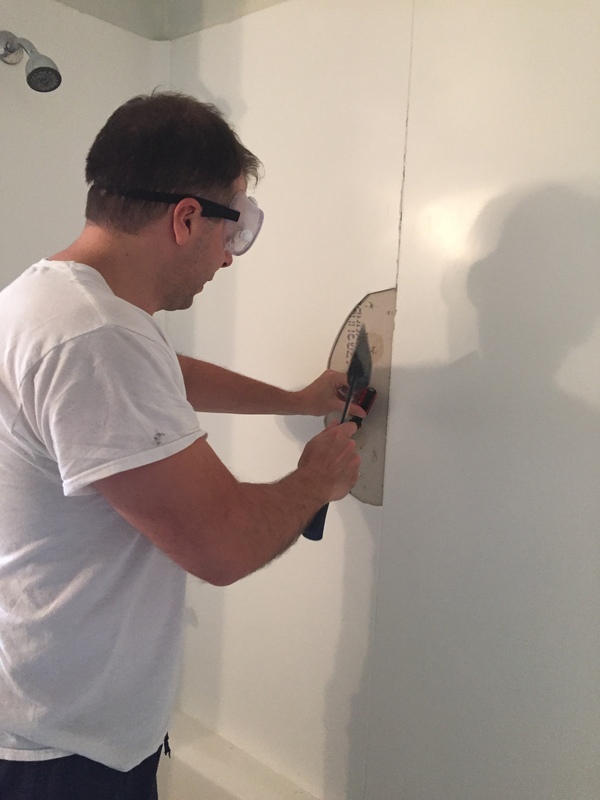 We had planned on saving the vanity and sink so we carefully removed the tile backsplash for reuse and the rest we got rid of and prepped the space for the shiplap feature wall! 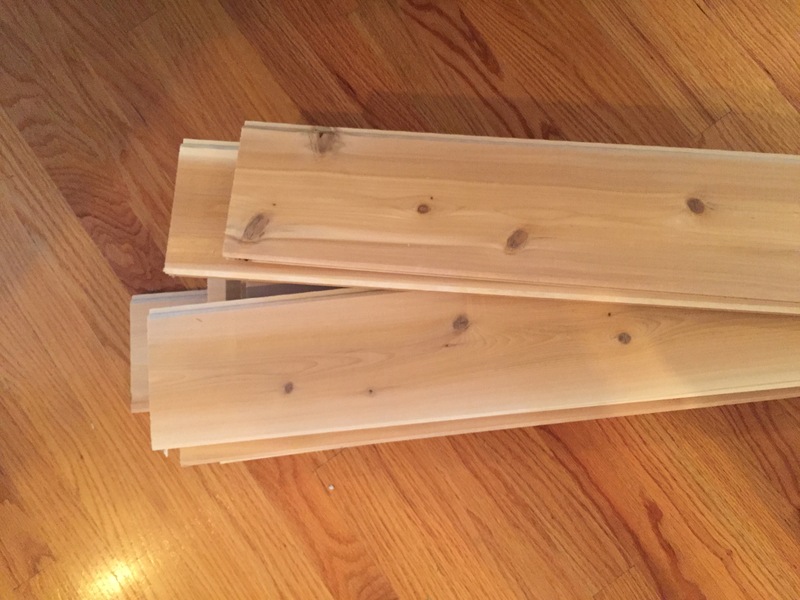 We measured out the space and bought tongue and groove planks cut to size at home depot. 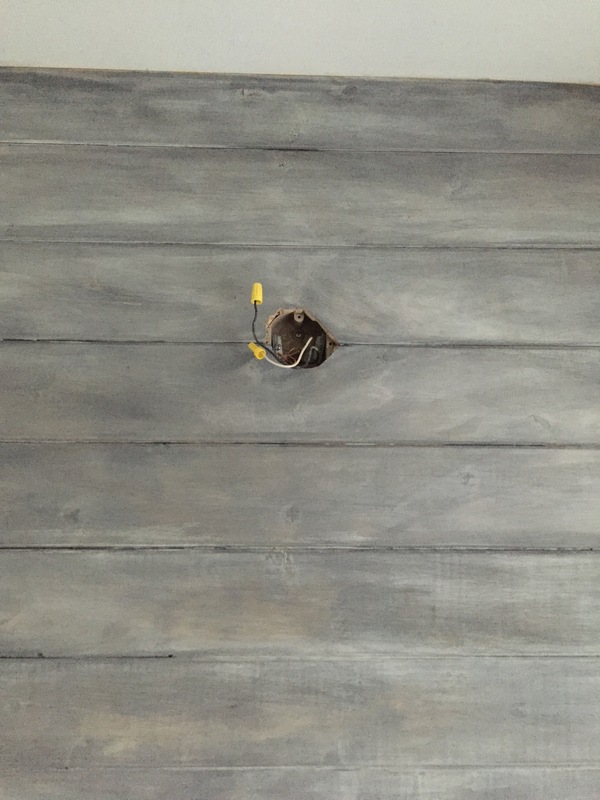 We then marked the wall for stud locations and nailed in each piece to the wall. 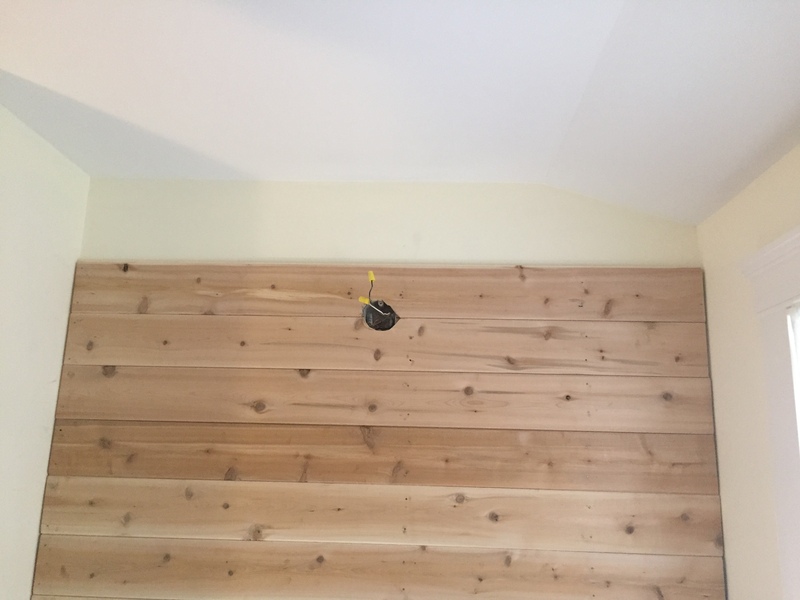 The top of the ceiling was angled so it was a bit of a bear to get that last board just right. 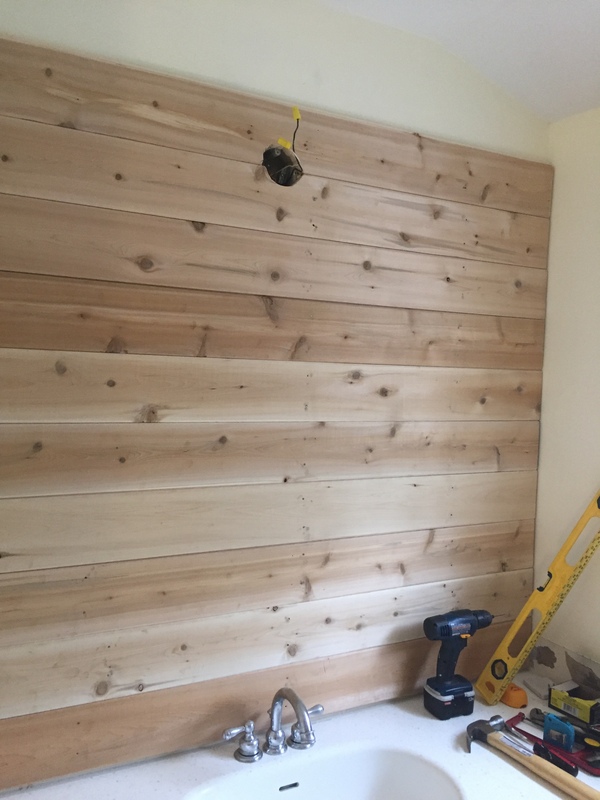 The wood planer came in handy for this task and my husband patiently sized it for the tricky space. 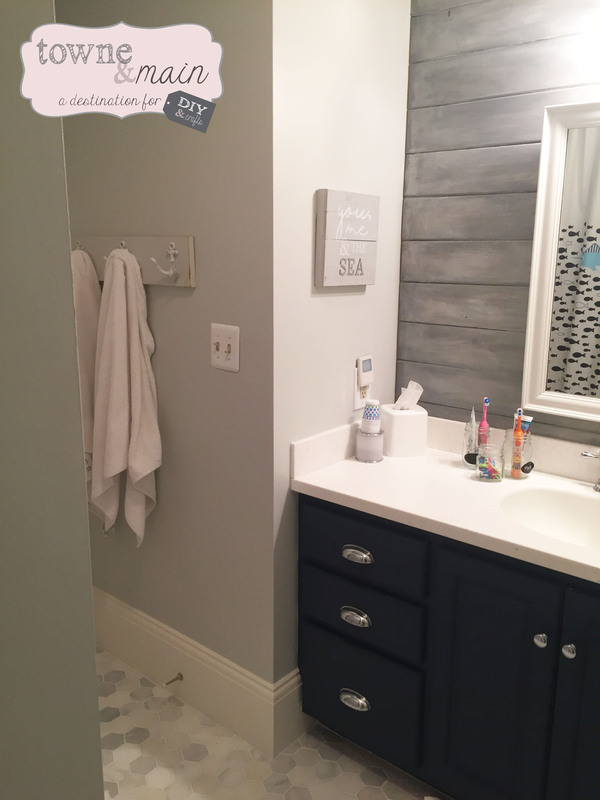 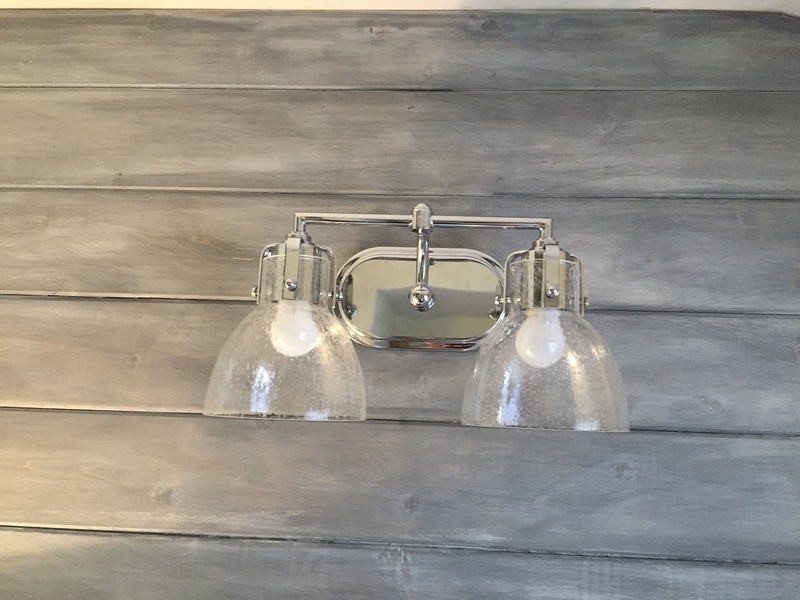 Once dry I sanded down the surface to reach the look I wanted, then white washed the wood with Benjamin Moore – Classic Gray paint. 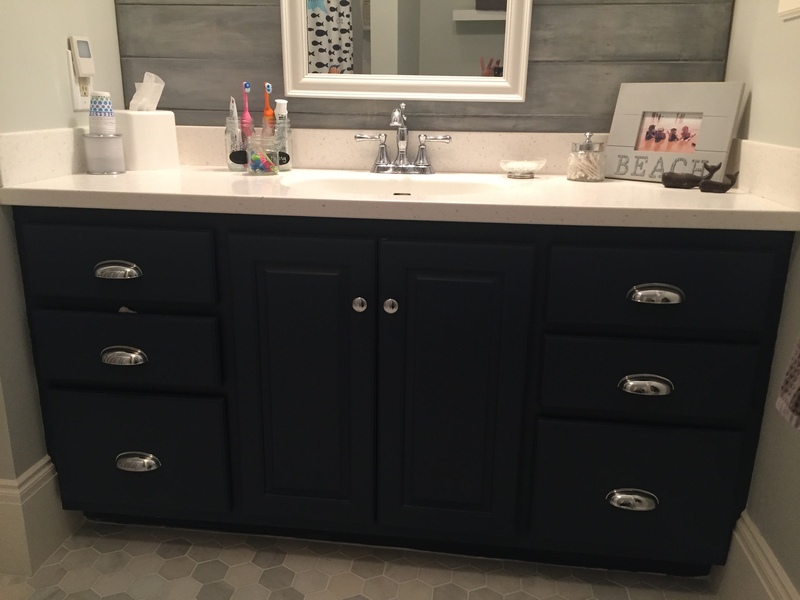 I would wipe on the paint then wipe off until I achieved the final finish sometimes watering it down – I’m pretty happy with the final outcome! 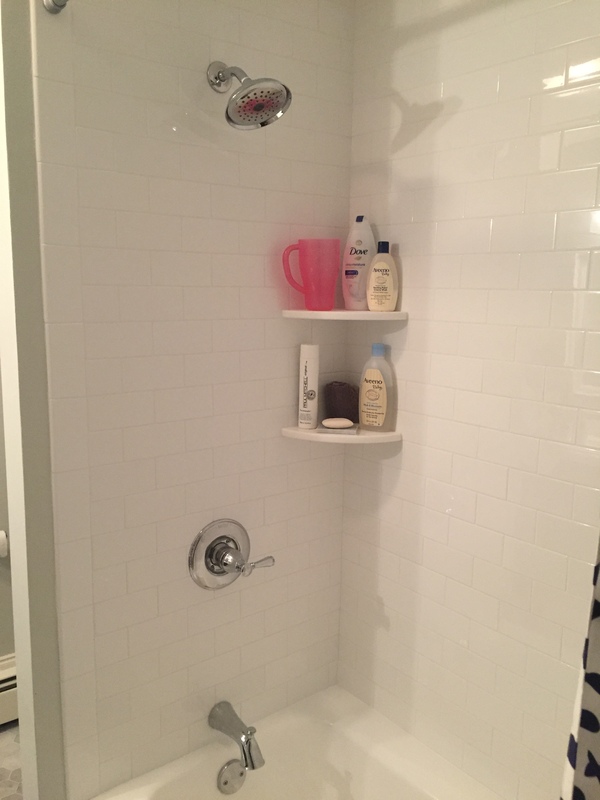 For the shower surround we did a clean white subway tile with white grout. 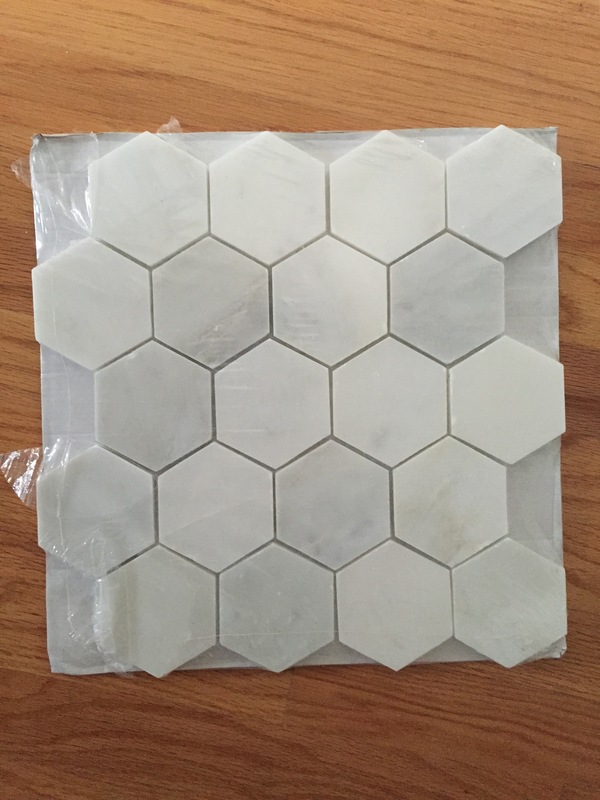 http://www.homedepot.com/p/Jeffrey-Court-Fresh-White-3-in-x-6-in-Ceramic-Field-Wall-Tile-12-5-sq-ft-case-96012/207097704. 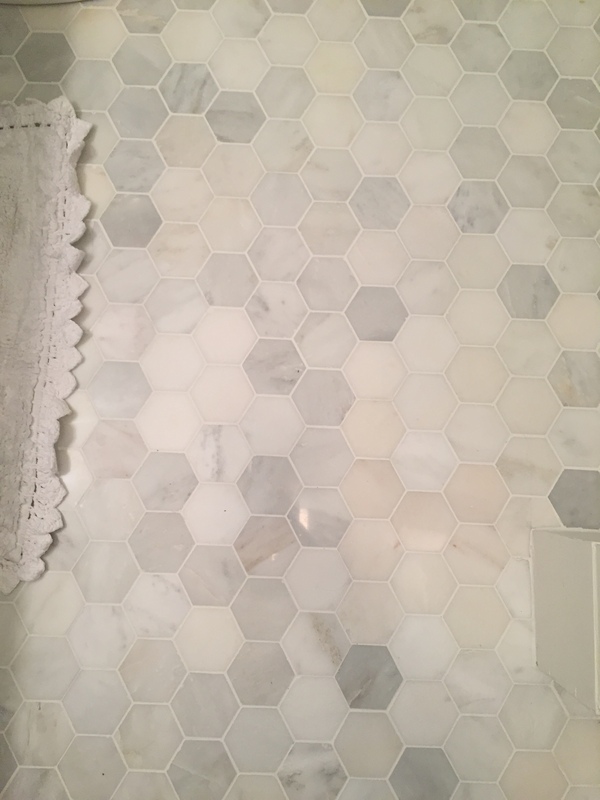 I had to go to a custom tile shop to get the corner shelves in a white marble. 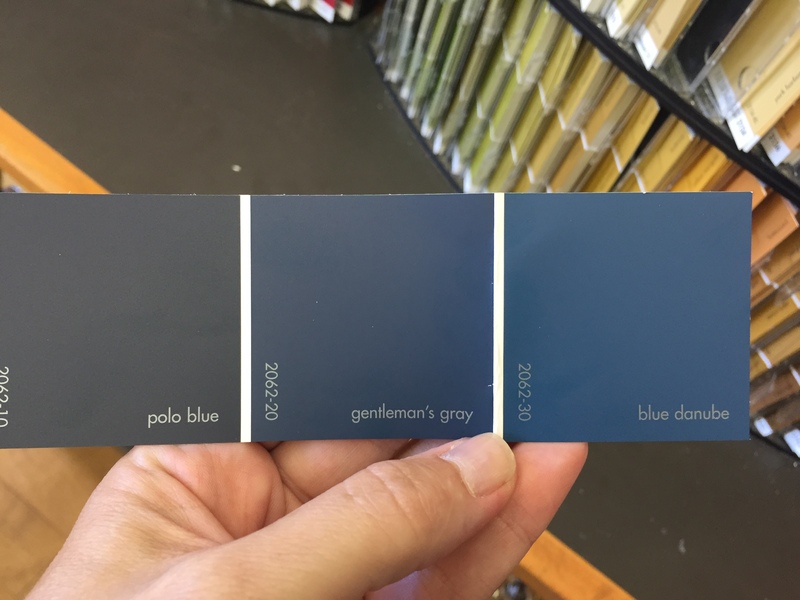 Vanity paint – Benjamin Moore gentleman’s gray – which is a nice dark blue and love how the chrome handles pop. 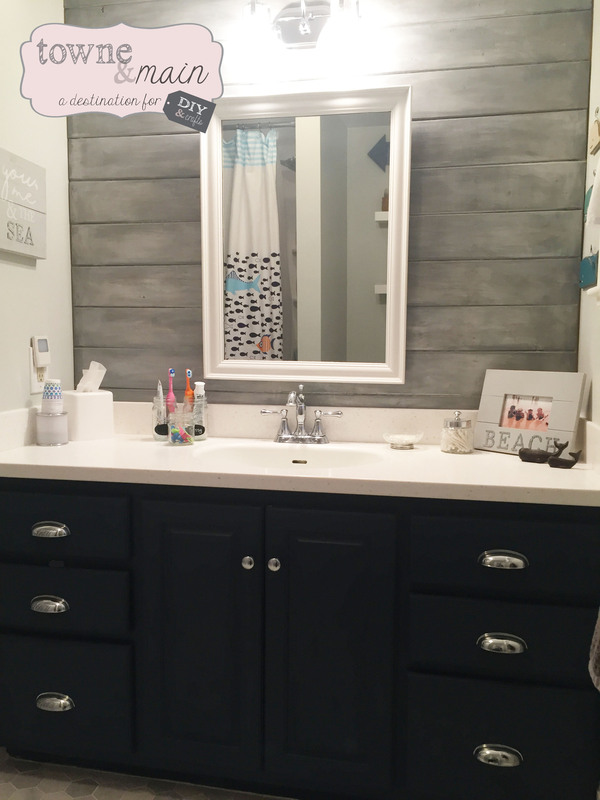 Not in love with the mirror and still looking for the perfect one for the space, and I’m also working on making wood bracket shelves to match the shiplap for over the toilet area, will post updated images when complete.